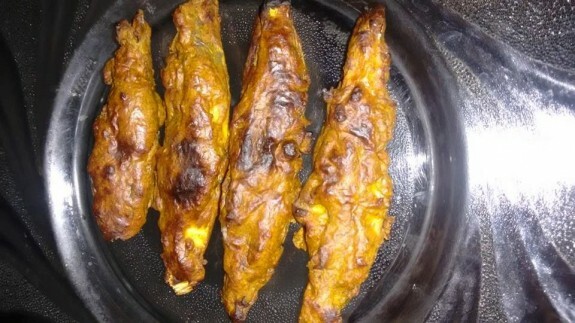 The Masala Route is here going to show you how to prepare Pomfret Tandoor. It is very easy and quick recipe. I make this recipe with Pomfret fish slices as I have a bigger Pomfret fish. But if you have small Pomfret fish, then it is suggested to marinate and do this recipe with the whole Pomfret fish as it would be tastier. 1. Trimmed all the unnecessary things of the whole Pomfret fish or Pomfret fish pieces and washed it thoroughly. 2. If you are taking whole Pomfret fish, then make 3 slits on both sides of the fishes. 3. Now take a large bowl and add turmeric powder, red chilli powder, garam masala powder, ajwain, hung curd, roasted gram flour, mustard oil, salt, lemon juice, coriander paste and ginger-garlic paste and mix it well so that any lumps will not occur. 4. Now in a plate take one fish or fish pieces one by one and rub the prepared masala on it. It is better to use your fingers so that Masala will go in very well. Also put the masala inside the slits of the whole fish. Do the same process for the rest of the fish. 5. Now marination is over and sits it for atleast half an hour in the refrigerator. 6. Preheat the oven in 230 degree C for 10 mins. 7. Put the fish/fish pieces one by one in the grill rack. You should put a tray under the griller so that your oven will not go dirty. 8. Set the time for 15 minutes. In the half way, you need to flip the fish on the other side and you can add little marinated masala to make it more juicy. Put it on the oven for another 8-10 minutes or grill until the fish will be golden brown. 9. Don’t over grill this as the fish may become rubbery. 10. So the Grilled Pomfret fish is all done, you can serve this with green chutney or fresh onions.